If you're interested in improving your home's health an appearance, there's no more effective or cost-efficient way to do that than to paint it. At Premier Painting, our Beverly painting contractors strive to provide every one of our clients with the highest quality painting services possible. Whether you interior or exterior painting services, wallpaper services, or even home repairs, you can rely on our contractors for great workmanship and professional customer service. Our painting contractors are all professionally trained and extensively experienced, so we can always handle any kind of painting job that you need performed on your property. We understand how important your home is to you, so we do whatever it takes to make sure you're getting everything you need from the services we provide. All of our work comes with complete satisfaction guarantee, and our professionals will ensure that you're totally happy with any work we perform. Give us a call today to ask any questions you have about our painting services in Beverly, MA, or to schedule your appointment, and we'll be looking forward to working with you. Your home is one of the most important parts of the lives of you and your family, so one of the biggest priorities you have is keeping it in great shape. 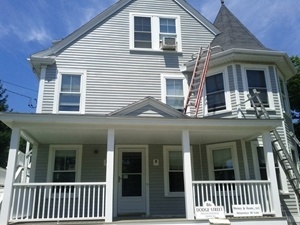 Our interior and exterior painting services in Beverly, MA are designed to help keep your home in great condition while enhancing its appearance, and our professional house painters in Beverly, MA can work with you to select the perfect painting products, colors, and textures to paint any part of your Beverly home. Painting the interior of you home is one of the best ways to improve its design and enhance its decor, and painting its exterior can improve its health while boosting its curb appeal. Our experts will be able to guarantee that you receive the best painting materials and services possible. Wallpaper can be a perfect addition to any home's interior design. Our Beverly painters can work with you to find the best wallpaper designs for your home's architecture, style, and decor, and we can provide you with a high quality installation. If you need to replace any of your home's wallpaper, or if you're looking to paint walls that are currently wallpapered, our professionals offer wallpaper removal services. We can remove any wallpaper thoroughly and without causing any damage to your walls. "Thank you so much! We love the work you did." If you are looking for a reliable Beverly painting contractor, please call Premier Painting at 978-532-7788 or complete our online request form.